Digit Geek > Recent Articles > ALT > What happens to your digital identity when you die? What happens to your digital identity when you die? On the internet, nothing truly dies, and this includes all the digital profiles you ever made. The only thing certain about life is death, or so it was until our lives moved online… While various cultures treat their dead in many different ways, there is a consensus about needing some sort of ritual to bid farewell to the deceased. This is not something we do online though. While it is ridiculous to have a funeral for a Facebook profile, and that’s not we’re suggesting… there is the need to identify profiles that have been abandoned or belong to the deceased, and each of the big tech companies has a way of dealing with death. Various digital platforms provide different methods to deal with the profiles and accounts of the deceased. Perhaps the most impactful area for this is social media. Facebook, notably the biggest social media platform on the internet, offers a number of ways to go about this. Mainly, you can choose to memorialise your account or delete it altogether. Going to Settings > General > Manage Account and nominating a friend as a legacy contact gives them access to certain actions like pinning a post, responding to a new friend request or updating your profile picture. In the event of your death, someone will have to go here and point to the profile, the date of passing and if possible, proof of passing away. Doing this informs Facebook that the account needs to be memorialised, or deleted, depending upon the preference picked by the user. A memorialised account on Facebook appears with ‘Remembering’ before the username. Twitter only allows the removal of a deceased person’s account through this form. Instagram, like it’s parent company Facebook, also allows the memorialisation of an account. Memorialised accounts on Instagram do not appear any different than a usual account but are effectively frozen in terms of likes, followers etc. Instagram provides a form for this process here. 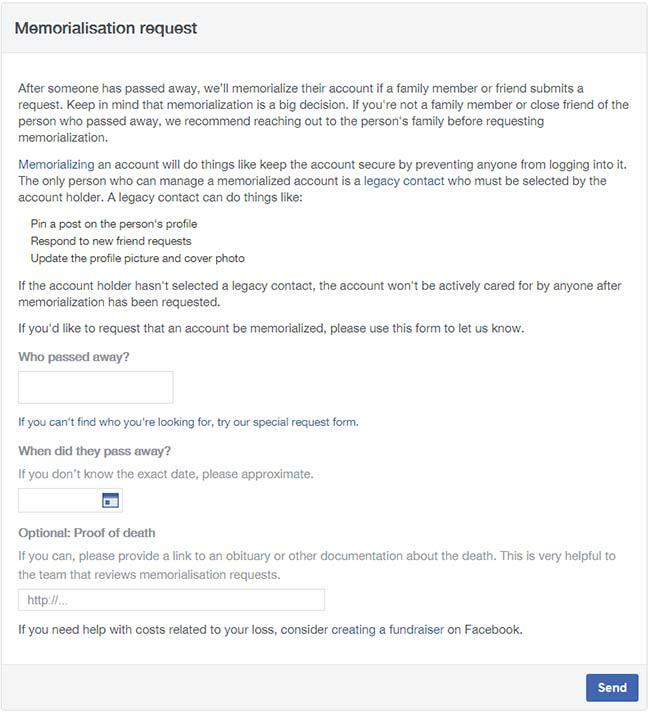 While memorialisation requires proof of death on Instagram as well, a deletion request also requires you to show that you are authorised to act on the deceased’s behalf. 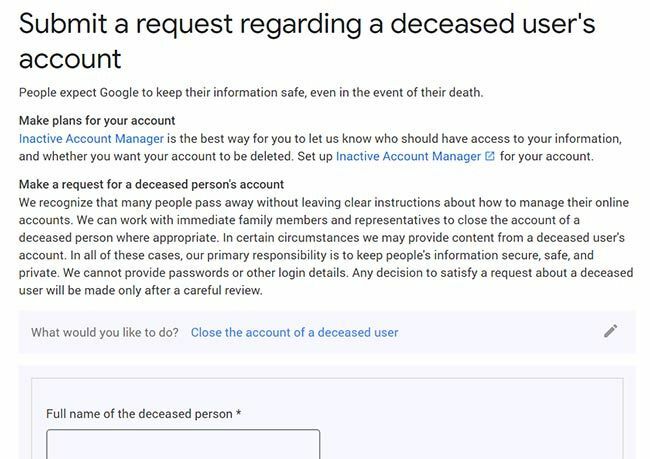 Google provides an Inactive Account Manager as well as a form here to close the account of a deceased person, as well as request funds or data from it. Apart from this, most digital platforms require a proof in the form of a link to an obituary or some official record to close a deceased person’s account. 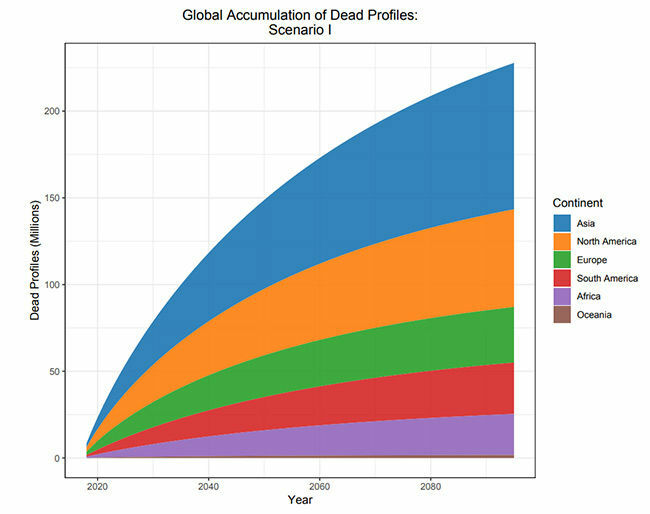 The number of digital profiles belonging to the dead is increasing every day. While there are numbers to back it up, a much simpler argument is that people are simply too lazy or unaware of the proper measures to take for the deletion or removal of an account. 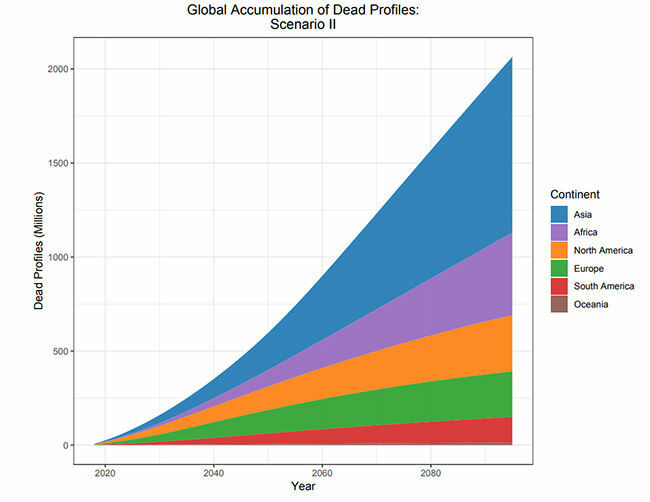 As a result, with newer digital profiles being created every day, there will come a time when the dead on the internet will outnumber the living. Is there a way to put a year on that? Turns out there is… (approximately). A study by Carl J. Öhman from the University of Oxford and David Watson from the Alan Turing Institute sheds light on some interesting areas pertaining to digital death. About putting a number on the dead profiles on social media, they pick Facebook as a choice due to its popularity. Their approach fixates on two scenarios – one in which there’s a global freeze on people joining Facebook (to estimate the floor) and one in which Facebook maintains its current growth rate to reach 90% penetration of a given group (to estimate a ceiling). This gives a range for the actual number to fall within. In the results, the first scenario leads to a maximum of nearly one in ten profiles belonging to someone who has passed away, while the second one leads to a higher percentage of three in ten. In either of the cases, the number of dead on Facebook doesn’t exceed that of the living within this century. But even in the conservative alternative of the first scenario, the number of dead on Facebook is in hundreds of millions – mainly comprising of countries like India due to high population and the US due to high penetration rates. Needless to say, online death is well on its way to become a mass phenomenon. Like most such phenomenon, it comes with its own set of ethical implications. There is undoubtedly a personal story involved in every single profile of the deceased that lies on Facebook today and will lie in years to come. However, taking all of these profiles together in the bigger picture paints a different possibility. In Facebook’s case, it becomes the singular owner of this data, making itself a vast repository of historical information that could be invaluable to future historians. If you take machine learning models into account, that often use big data repositories to learn about, among other things, human behaviour then it becomes even more evident how a data reserve like this could be very important to future generations. As a result, there’s a need to preserve this data. This need could be driven by several factors, ranging from religious, sentimental, scientific or even aesthetic values, but would still make it worthwhile nonetheless. However, for a company or corporation like Facebook, what makes this data “worth preserving” is its ability to contribute to the profit of the company. The profiles of the users who have passed away might serve this purpose. People looking to mourn those users will visit their profiles, generating hits, clicks, exposure and traffic – all things that Facebook can profit from. There’s also the previously mentioned possibility of this data being used to train software and retrieve historical insight. However, when either of these possibilities turns non-profitable, it would be logical for Facebook to delete this data, or at least modify it to be profitable. However, the value of this data is not to be perceived as purely economical. As explained in the paper, this data can be compared to archaeological finds and the way we evaluate them. A diary from the Medieval ages won’t be valuable because of the data it holds, its value will lie in other factors that define its existence. Additionally, as Orwell points out in 1984, those who can control the data about the past can also control the way we perceive it. The only way to prevent the possibility of this happening is by decentralising this data and making it accessible to multiple stakeholders. If anything, our current experience with how data is handled on social media, especially Facebook, makes it necessary to do so. Are the Dead Taking Over Facebook? A former tech-support desk jockey, you can find this individual delving deep into all things tech, fiction and food. Calling his sense of humour merely terrible would be a much better joke than what he usually makes. We have a conversation with Animesh Samuel on using natural language processing for process automation. Long before the internet and instant messaging, fake news was having a real impact. NASA's James Webb Space Telescope has found biosignatures in the atmospheres of Trappist-1 e and f.